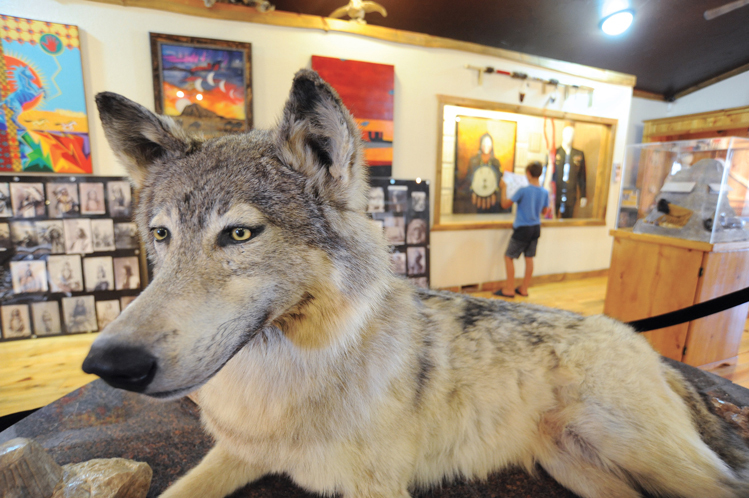 A taxidermied wolf inside the Pine Ridge Visitors Center near Kyle was struck by a vehicle and killed on the Pine Ridge Reservation in 2012. Was a gray wolf roaming the lakes country of Marshall County this winter? A coyote hunter from Britton thinks he may have shot one by mistake in January. Wildlife officials are investigating his report. Several years ago, a gray wolf was shot near Custer. John Kanta of the state Game Fish and Parks Department thought it wandered from the Great Lakes region. Another gray was hit and killed by a car on the Pine Ridge Indian Reservation in 2012. He weighed 130 pounds. The remains were preserved by Pete’s Taxidermy of Gregory, and are now on exhibit at the Pine Ridge Visitors Center near Kyle. He was wearing a radio transmitter, so officials quickly surmised that he came from Yellowstone National Park. Gray wolves are bigger and stronger than timber wolves. Grays were lording over the river breaks of western South Dakota when farmers and ranchers first settled there. The wolves preyed on livestock, so they were eventually hunted to extinction in South Dakota. So named because he had lost a paw in a trap early in his life, Three Toes gained a reputation as a bloodthirsty killer by 1912. He left his unmistakable paw print at ranches throughout Harding County. Infuriated ranchers tracked his whereabouts and devastating destruction. They estimated that his lifetime of kills exceeded $50,000 in cattle and sheep. Three Toes lived to an old age, and reached the peak of his destruction in the 1920s. Gilfillan wrote, "For first, last, and all the time, Three Toes was a killer. Other wolves might kill one cow or sheep and eat off that and be satisfied. But Three Toes killed for the sheer love of killing. He would kill on a full stomach as well as when hungry. On one occasion he visited three different ranches in one night, killed many sheep and lambs at each one, but ate only the liver of one lamb." Officials bumped the bounty for Three Toes to $500, but no hunter could catch the cunning old wolf. In July of 1925, federal wolf hunter Clyde F. Briggs settled on a ranch near the center of Three Toes’ hunting range. For weeks Briggs set his traps and Three Toes carefully eluded them. But he was tricked on July 23 by a hidden trap. The earth around him was scratched and plowed by his frantic efforts to escape from the trap's grasp by the time Briggs arrived. The trapper muzzled and hog-tied the big wolf and put him in the backseat of his car, intending to deliver him to Rapid City alive. But soon a passenger cried, "I think he's dying." "Briggs stopped the car, and looking around, found the wolf's eyes fixed on him. But the eyes did not see him, for the wolf was dead," wrote Gilfillan. "Call it a broken heart, or what you will — something of this sort is what killed the old wolf. He was resting easily when found, his wounds were superficial … but there was something in his grand old spirit that could not brook capture, and Nature, more merciful than he had ever been, granted him his release."